Emergencies can happen at any time to anyone and affect any part of your body, including your mouth. 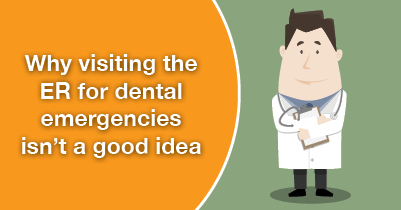 While it’s usually sound advice to seek immediate medical attention in case of an emergency, sometimes a hospital is not the best choice for treating your dental problems. At my dental office in Austin, we feel that it’s important to know the difference between injuries that require a hospital and those that should be treated by a dentist. If you’re experiencing any of the problems above, seek medical attention at your local hospital, or call 911 immediately. In situations like these, your dentist should be the first person you contact as they’ll be the best trained and best equipped to provide the treatment you need. Whether it’s a cracked tooth or a toothache, only your dentist has the proper technology to get your smile back to strength. The best way to help avoid dental emergencies is prevention. Some of the easiest and most effective ways to keep dental problems away are probably things you already do, so keep doing them. For example, brush and floss everyday and make sure to keep up with your dental appointments. Additionally, make sure to always wear a mouthguard when playing sports and limit the amount of smile-damaging snacks like caramel and popcorn. By taking these precautions with your teeth, your chance of a dental problem decreases. If you do happen to experience a dental emergency, please don’t hesitate to call our Austin dental office as soon as you can. We’ll make sure to get you seen immediately and we’ll work with you resolve the problem. Just don’t wait. The best first step to fixing your smile is acting quickly before the problem gets worse. You may have heard of dental veneers before, but what exactly are they, and what are they used for? At our dental office in Austin, we have a wide variety of cosmetic dentistry options available to get you your ideal smile. However, dental veneers are one of the most common and versatile cosmetic dentistry procedures, so we’d like to explain what they are, how the procedure is completed, and what they can help fix. Dental veneers are essentially super thin shells of porcelain, custom-made and shaded to suit your look and style. They require an artistic eye and are carefully crafted to meet your specifications as far as size, shape, and color are concerned. Once created, the veneers are bonded to the front surface of teeth and can result in an immediate and easy smile makeover. Typically, your veneer treatment is simple, straightforward, and starts with an initial consultation with your dentist in Austin. At this preliminary visit, your desired results will be discussed and your treatment plan will be determined. During your first treatment appointment, your teeth will be prepped for the veneers. This means that a thin layer of the surface enamel will be removed, allowing space for the veneer to cover your old tooth. Often, temporary veneers will be placeholders while the permanent ones are being milled at our dental lab. Once the permanent fixtures are completed, they will be adhered to the surfaces of your teeth using a strong bonding material and an artistic eye. Your smile is something that really matters, so if yours is less than ideal, give our Austin dental office a call today. We’ll schedule a consultation to discuss your smile goals and talk about the best way to reach those goals and get you your dream smile.